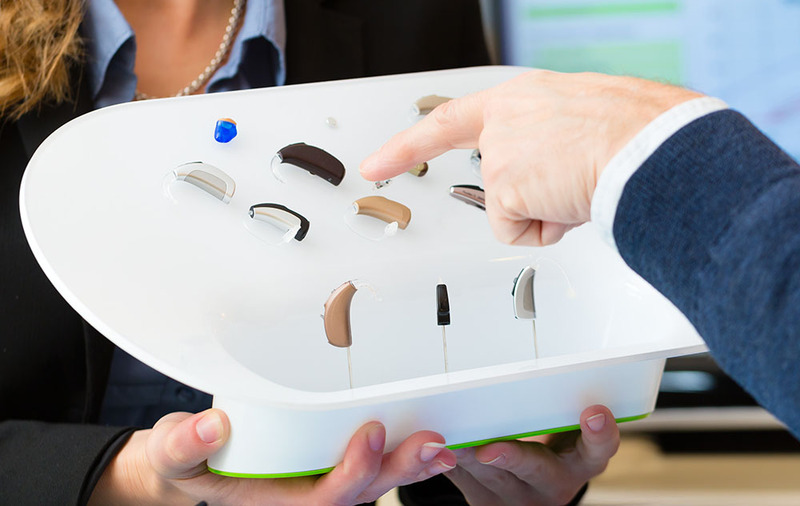 These days, there are many options when it comes to hearing aids. Your audiologist will recommend one or more styles based on your degree of hearing loss, ear anatomy, manual dexterity and budget. Here is a brief explanation of the different styles. This is the most common style of hearing aid sold today. The hearing aid is housed in a compartment that is worn behind the ear. A clear piece of tubing directs the amplified sound to a small earmold or earbud worn in the ear. BTE hearing aids are fairly discreet and are available in many colors. They are suitable for mild-to-severe hearing loss. Because they require manipulation of three parts (the component behind the ear, the tubing and the earmold) they are not the best option for people with severe dexterity issues. This style is a variation on the behind the ear style. Instead of a piece of tubing that runs from the unit behind the ear, a small electrical wire transmits sound to a receiver that is inserted into the canal. Because no earmold is necessary, the open fit reduces sound occlusion. The RIC style is appropriate for mild to moderate hearing loss and little dexterity issues. The ITC style of hearing aid fits completely in the ear canal. There is no portion worn outside of the ear. It is custom made to fit your ear and the outer portion can be tinted in various colors to match your skin tone. This style is appropriate for mild-to-mildly-severe hearing loss. The controls on the in the canal style are harder to operate for people with dexterity issues, but insertion and removal are easier. This style is slightly larger than in the canal styles. They are custom made and fit completely in the ear. They are easier to insert than in the can hearing aids. The outer portion is available in a variety of colors to match many skin tones. People with mild-to-severe hearing loss can wear ITE hearing aids. If you want a hearing aid that is completely discrete, this is the style for you. The hearing aid fits in the ear canal. Only a small “handle” protrudes to make removal and insertion easier. This tiny hearing aid is perfect for people with no dexterity issues and mild-to-moderate hearing loss. A fairly long ear canal is necessary for this style to be successfully fitted. This is the smallest and least visible hearing aid made. It fits deep in the ear canal and is completely invisible. It is custom made, but can’t be worn by all people. Your ear canal must be just the right shape and size for this style. When deciding which style is best for you, take into consideration your lifestyle, dexterity, eyesight, degree of hearing loss and budget. Some styles may have features you need, others may offer features that aren’t important to you. Your audiologist can help you pick the best style.